Cats, dogs and humans have most of the same bones, but they are significantly different from each other. Cats and dogs, in the order Carnivora, are more like each other than either is like humans. Cats and dogs have long muzzles (longer in dogs than in cats) with grasping and tearing teeth; humans have a flat-faced skull and less specialized teeth. The braincase dominates the human skull but is relatively smaller in cats and dogs. Cats' and dogs' shoulder bones are designed to support the weight of the upper body. Cats' and dogs' flexible spines act like a suspension bridge, while the human spine acts like a support column. Unlike cats and dogs, humans can reach over their heads because of our shoulder structure. Human legs are longer than the arms, while in cats and dogs, they are approximately equal. Cats and dogs walk on their toes while humans use the entire foot. Human hands are unique, as are cats' retractable claws. 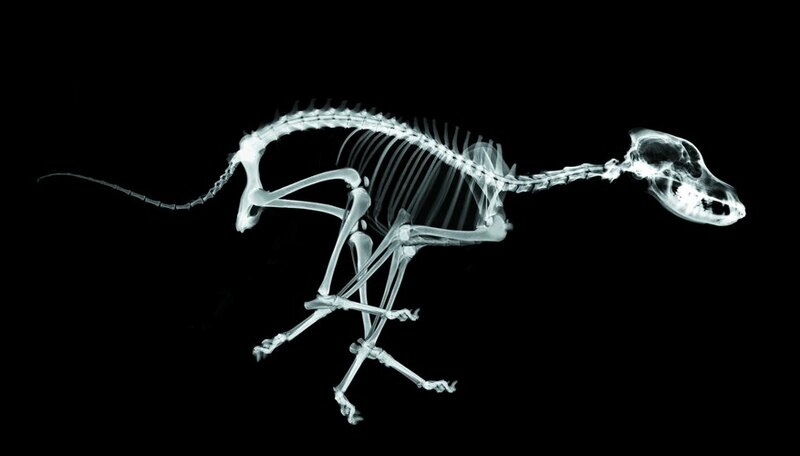 Because humans are bipedal, the pelvis is rotated relative to cats' and dogs'. The coccyx is all that remains of the human tail. "Extinct Humans;" Ian Tattersall and Jeffrey H. Schwartz; 2001. Broyles, Robyn. "Differences Between a Cat, Dog, & Human Skeleton." Sciencing, https://sciencing.com/differences-cat-dog-human-skeleton-5669751.html. 13 March 2018.